It is the axiom of landscape photographers: Wait for the Light. 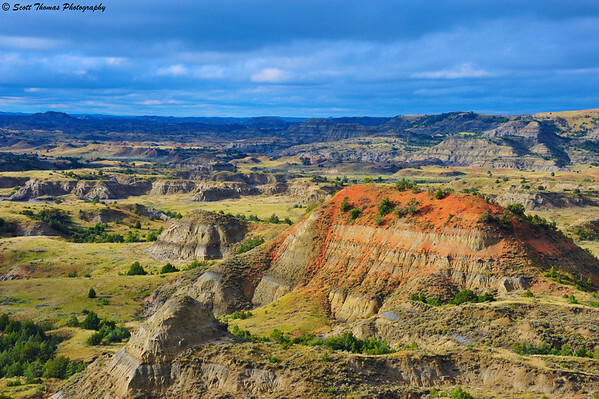 Below is the first photo I took when I walked up to the viewing overlook at the Painted Canyon Visitor Center in the Theodore Roosevelt National Park near Medora, North Dakota. 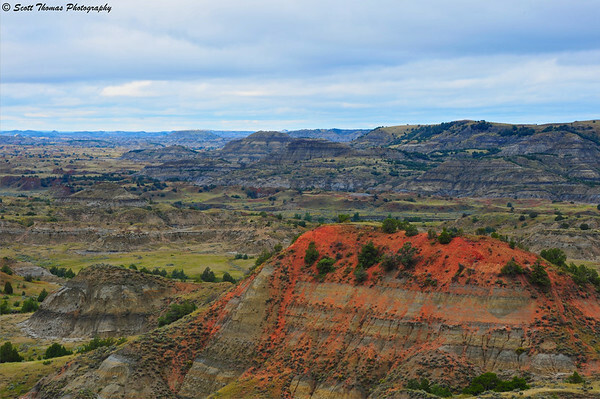 The Painted Canyon in Theodore Roosevelt National Park under an overcast sky. Nikon D700/28-300VR, 1/30s, f/16, ISO 220, EV 0, 105mm focal length. While it is a beautiful photo of the canyon, you can just see on the horizon a line of sunlight. The axiom told me to wait. I did and 15 minutes later I took this photo. The Painted Canyon under sunlight coming through a break in the clouds. Nikon D700/28-300VR, 1/80s, f/16, ISO 200, EV -0.3, 78mm focal length. One of the kinds of natural light I look for (actually more like crave) is front lighting with dark clouds on the horizon. Yes, I was thanking the photography gods as I set and composed several photos of this majestic canyon as the Sun transformed it with its light. All I did was wait for it. This entry was posted in Nature, Photography and tagged 28-300mm, badlands, buttes, landscape, light, national park, nikon D700, north dakota, theodore roosevelt. Bookmark the permalink. What a difference a little lighting can make! I think the most beautiful light for landscapes is right after a storm, when the sun peeks out again, preferably in the evening. This was later afternoon lighting and, while it was no storm, it had rained most of the day. This was the first rays of sunlight the canyon had seen all day. I agree with Michaela, what a difference. I am glad you waited, first of all because we now get the opportunity to see these photos, secondly because it shows how patience can pay off. The motive itself is of course fantastic. Thanks, Birgitte! It was chilly with a stiff breeze but I could not leave until I saw what the canyon would look like in the light. It was awesome seeing the sunlight creep across it and bring out all the details and colors right before my eyes (and lens). Well worth the wait! That turned out beautifully! Changing light can almost drive you crazy for wide landscape shots like that. Well, it did that, Terry! Lots of outtakes but the keepers are magnificent! What is there to say? Nature creates landscapes beyond our (My) imagination. Good you waited for the right light. I’m glad we have a good photographer on spot so that we can all share this. Thanks Scott. Patience is always a good thing when it comes to photography, Kathy. Of course, that took me years to comprehend myself. You’ve written and photographed the light recently yourself. Very well I might add. It’s amazing what the natural lighting can do, I have to pay more attention to it the next time. I think I get distracted by the scenery and forget about the light sometimes. It is hard when there is something fantastic in front of you. What I usually do is first get some photos and review them. Ask myself if this is the best way to photographic it. I then look for better angles to do so. I like the detailed, textured look of the second photo. I’m curious–did your eyes see as much difference in the colors as the camera saw? Amazing stuff, light. Yes, my eyes saw a big difference. The canyon did literally get transformed as the sunlight hit it. Such amazing color the right light brings us! Interesting how you said, “right light”. For the bottom photo, it was the right light for a few seconds and then it changed to a different “right light”. Fleeting it was and I was so glad to catch it. Thank you, Lisa, for stopping by and for leaving a link to your wonderful blog! It’s always astonishing to realise what a difference a change of light makes… particularly sunlight. I know this instinctively, as an artist. Best, really, for strong shadows that clearly show off the shapes of things, showing convex, concave.